To keep up to date with all the latest developments please visit our news page where you can find details of general news of interest and our regular rail user group meetings. (a) To encourage greater passenger use of the rail line between Sunderland, Hartlepool, Stockton and Middlesbrough, as well as services beyond these limits. (b) To actively campaign for better rail services. Coast line trains to run from earlier until later, daily. Much better rolling stock to be used. New stock to be hybrid. Proper step-free access to be provided on all stations, including ‘Harrington Humps’ on every platform that needs them. Modify Saltburn - Darlington timings in the light of changed patterns at Darlington. Modify Coast line timings to connect in a user-friendly manner at Thornaby and Newcastle with all other operators. Construct the long-planned Horden / Peterlee station, south of Seaham. Three-coach trains to be introduced on the Hexham to Nunthorpe service. The re-introduction of the ‘extra’ half-hourly Newcastle to Hartlepool service and the possibility of it being extended south of Hartlepool, perhaps even to York. The removal of a number of anomalies in the fare structure between Newcastle and Teesside. Reduce / remove the Transpennine ‘frontier’ at Thornaby with services to Middlesbrough being extended to Redcar Central and / or Hartlepool, Seaham and Sunderland. Campaign to protect passengers from having to change trains during journeys which are presently served by through trains. 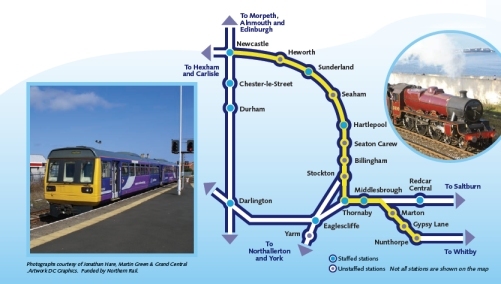 Additional regular service to link York with every station between it, Yarm and Sunderland. Develop more through Coast line - Whitby services, to run the year around. Most meetings have a guest speaker from within or associated with the railway industry. If you would like more information, please contact us. The railways of East Durham were originally built to serve the coal mines with passengers being a secondary consideration. The present coast line resulted from the joining up of many of these colliery lines. This was not completed until as late as 1905 when the North Eastern Railway connected Hartlepool with Lord Londonderry’s railway at Seaham, a project that required the construction of several large viaducts across the Denes. The original web of lines can be seen on the historic tile maps still in situ at Hartlepool (then West Hartlepool) and Middlesbrough stations. Coal trains still use the Durham coast line, but now carry imported coal and also biomass from Tyne Dock to the Yorkshire power stations, whilst other regular freight services serve the cement terminal at Seaham and Hartlepool Nuclear Power Station. Northern services link Nunthorpe and Newcastle via the coast calling at James Cook Hospital, Middlesbrough, Thornaby, Stockton, Billingham, Seaton Carew, Hartlepool, Seaham, Sunderland and Heworth. Trains generally run to MetroCentre and Hexham with some trains running to/from Carlisle. On Sundays in the summer there is a through service to and from Whitby. Grand Central trains link Sunderland, Hartlepool and Eaglescliffe with Northallerton, Thirsk, York and London. Middlesbrough for Northern services to Saltburn and Whitby. Thornaby for Darlington and TransPennine Express trains to York, Leeds and Manchester. Newcastle for services to the Tyne Valley, Morpeth, Alnmouth and Edinburgh, and to Durham, Darlington and the South.